Is it 10/10/10? Or perhaps lO/lO/lO? 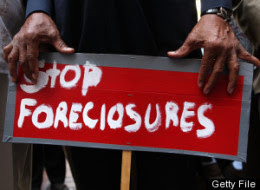 Either way, the world is coming to an end, as is evident in this Getty File stock photo in a recent Huffington Post article, "White House: No Need For National Foreclosure Moratorium". Discovered by Jessica M, we need to Stop FOREClOSURES, but start underestimating the amount of space we have to correctly use all uppercase letters on our home brew signs.